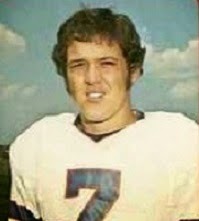 Twice a consensus first-team All-American in college in 1970 and ‘71, Bateman was chosen by the Dallas Cowboys in the third round of the 1972 NFL draft. Veteran Ron Widby was traded away and Bateman averaged 38.2 yards on 51 punts as a rookie and 41.6 yards on 55 punts in ’73. A poor start in 1974 caused the Cowboys to waive him midway through the season and he was picked up by Buffalo. Bateman’s performance improved and he averaged 43.9 yards for the Bills, up from 36.9 in his first seven games for Dallas. He had a good 1975 season, averaging 41.6 yards. Bills went 2-12 to finish fifth in the AFC East. Bateman averaged 39.9 yards on 81 punts in 1977 but was released during the ’78 preseason. An attempt to come back with the 49ers ended with his choosing to retire during the preseason, but he did try one more abortive comeback with the Cardinals in ’80 before leaving the game for good. Over the course of six years, Bateman punted 401 times and averaged 40.9 yards, with 262 punts for a 41.7-yard average coming with the Bills. He was inducted into the Utah Sports Hall of Fame in 1987.